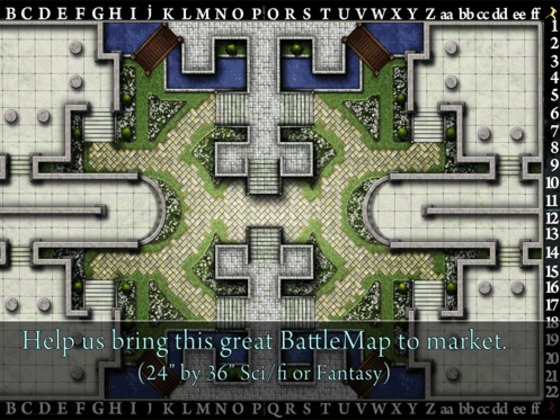 Conflict-RPG (http://www.ConflictRPG.com) has had a great opening run with our first Battlemap, Keeper's Keep". Now we're expanding our product line with our latest map, "The Ancient's Atrium". The 24" by 36 " symmetrical Battlemap can be used in both fantasy or sci-fi campaigns settings, as well as the tactically-heavy, Pathfinder compatible Conflict-RPG. The map will be printed on heavyweight paper with a high-gloss finish. With a 9 millimeter thickness and 89 rated brightness, the "Ancient's Atrium" is one of our sturdiest and most vivid maps to date. Funds from this Kickstarter pre-order initiative will be used to produce and market the first run of the Ancient's Atrium Battlemap. The Ancient's Atrium battlemap depicts a beautifully designed garden laced in ivory, a sanctuary of peace and harmony that invites comfort. Yet this Atrium is wickedly designed to become the center of conflict and strife. Perfectly symmetrical for tactical fairness, this map is made for strategists. Providing a visually stunning environment that can be used for fantasy or sci-fi role-playing settings. Any GM can make the Ancient's Atrium place of peace and well deserved rest for players, or, if you're like us, a place of unexpected conflict. The minimum contribution grants you access to behind-the-scenes blog posts about the map's development. These project updates will be hosted on Kickstarter.com. The previous reward, plus a hi-res PDF (or .GIF) of the finished map. The PDF can be used in Virtual Gaming Tables, Personal Printing or if you have an overhead projector, projected right onto the gaming table. The previous rewards, plus a cover-to-cover PDF version of the Conflict Roleplaying Rulebook. The previous rewards, plus a printed copy of the finished "Ancient's Atrium" 24" x 36" BattleMap mailed to you. The previous rewards, plus a printed copy of the "Keeper's Keep" 24" x 36" BattleMap (Hi-Res) mailed to you. At this pledge level you now have two different BattleMaps. The previous rewards, plus the limited edition "So Conflicted!" T-shirt. Your choice of black, brown or blue. Go to Conflictbooks.com to see the t-shirts. You also receive a signed and printed copy of the latest Conflict Roleplaying Rulebook. The previous rewards, plus a signed Conflict Skirmishing RPG Boxed Set. Plus a "thank you" in the next Conflict-RPG book's acknowledgment section. Your name! Your character's name! Your GM's name! Doesn't matter to us. Spell it out, and it goes in, but keep it decent. The previous rewards, plus a statue of you or your character's likeness added to the final production version of the "Ancient's Atrium" BattleMap! This statue will be illustrated by a professional artist and then added to a pedestal on the retail version of the map. How cool is that! If you have already noticed we emphasize map details. One of the detail in the map thats noteworthy is the addition to red blooms in the garden and Koi fish added to the waterways. See attached for a zoom in view and let us know what you think! Here is How Kickstarter Works. To make a pledge to a project, click the green “Back This Project” button on any project page. You will be asked to pick your pledge amount and select a reward. From there, you will go through the Amazon checkout process. Note that you must finish the Amazon checkout for your pledge to be completed. If funding does not succeed, do backers pay anything? Here is the link to the Kickstarter's FAQ. I have seen a few of this pledge initiatives before and just assumed the community was familiar with the kickstarter website. Sorry about that fellow gamers. Although, now I understand the hesitation. Hopefully this clears things up and we can this map to you and games stores everywhere. At $18 dollar pledge you receive : A printed copy of the finished "Ancient's Atrium" 24" x 36" BattleMap mailed to you. I also made this map double-sided. Hopefully we get a chance to bring this map to market. Back this project..